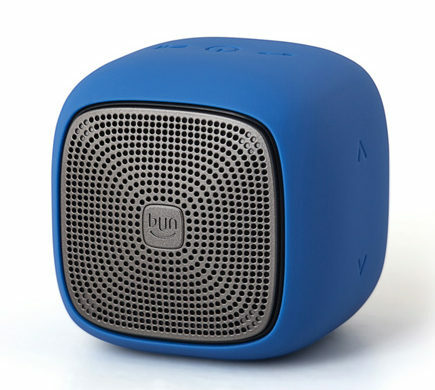 The Edifier MP 200 is a small splash proof and dust proof Bluetooth speaker. It has an attached cord for placing on a bicycle, backpack, or belt loop for easy portability. A smooth, rubbery material surrounds the Edifier making it soft and easy to hold. The sound, however, varies depending on how you are listening. The Edifier plays audio through streaming from a Bluetooth device, attaching to a PC via USB, or by adding a micro SD card. It also works as a speaker phone. Pressing the center button on top of the device cycles through each option, as well as turning the speaker on and off. There is a speaker on the front and back of the Edifier; the audio from the back sounds more bass and distorted, especially the louder it gets. Spoken word is much clearer than music. Volume while listening with a SD card is significantly louder than streaming. Speaker phone is clear but too low to have a conversation, even with the volume at maximum on both the phone and the Edifier. I found when using the Edifier with my MacBook Pro the music seemed to fade in and out; it would get softer, then louder, then softer again. This happened consistently. This is not an issue with other Bluetooth speakers I’ve tried or using the built in computer speakers. Volume controls are on the side of the Edifier, which double as the track forward and back buttons. A long press on the volume down advances to the next track, volume up goes back one track. That seems counterintuitive, but it works. The Edifier MP 200 Speaker comes in seven colors and costs $34.99. Size wise it would make a great stocking stuffer for the upcoming holidays, and its portability is a big plus. As long as users don’t try to listen to music at full blast, this is a decent portable speaker that boasts up to 12 hour battery life.